We use these for our 2 year old for swimming lessons and have never had an issue. They are expensive but I haven’t found a reusable one that will fit him so we will stick with these until he is out of nappies. These are absolutely perfect for summer and just for all round swimming at the pool. Initially I was a bit confused about whether to undo them to put them on but now that i’ve got the hang of it it’s all good. My daughter loves that they have fishies on the front too. Can't live without during the summer months with babies! Amazing! Super absorbent and we can swim the pool with confidence with no leakages. They are also not bulky under swim pants so we can swim incognito with these swim pants. Depending on how long you are in the pool they can also be re-used as long as there was no pee or poo. I found these to be fantastic for my son and his swimming lessons. Easy to use. Huggies are the only product I buy – they are really absorbent, and reliable. These swimmers make trips to the beach a breeze. Highly recommend these pants. Our swim school always required swim nappies and for good reason. I only used the Huggies and wouldn’t have bothered to try any other swim nappies. Even when my children were out of nappies in the day, I still would pop one on my daughter for peace of mind. I love these for my twins swimming lessons. As long as the don’t wee or poo in them I am able to wash and they can wear again but they do also hold some wee and poo in them ???? We would not be able to survive the summer without swim nappies for the toddler. Necessary for pools and or water park play. However, way too expensive. We use these all the time. From a swim in the pool to going to the beach. They are great to reuse too after washing them. Great for holding in poo explosions. Easy to get on and remove. Good for wearing under swimmers, not bulky. Will definitely continue using this product. Who would’ve thought….nappies to swim in! A total must have for families that swim regularly. Good fitting, light elastic legs and easy to put on. 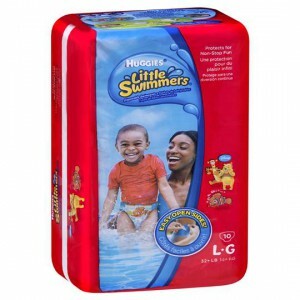 How would you rate Huggies Little Swimmers Swim Pants Large?